Aleksandra's Note: June 28th is one of those days that history never forgets. Although most of the world will know that date as being the anniversary of the act in Sarajevo, Bosnia that lit the fuse of World War I in 1914, for the Christian Serbians this date will always mark the anniversary of a monumental battle between Christianity and Islam on a field in Kosovo in 1389. Today is a day to honor the incredible sacrifice the Serbs made that one single day, so long ago, in the name of Christianity. They were truly the true believers. What a race they were. For old memories that's the healing. Wherever I go I will be back, you know. For truth of battle shall live forever. Lord, forgive us all of our sins. Give the courage to sons and daughters. Kud god da krenem Tebi se vraćam ponovo. Junaštvom daruj kćeri i sinove. Prince Lazar was born in 1329 in Prilepac to the aristocrat family Hrebeljanovic. His father Pribac was a Logotet-secretary doing very confidential work for King Dusan the Powerful in the royal palace. Young Lazar was raised in the palace, and was respected by the King who entrusted him with the rule of two parts of his kingdom: Srem and Macva. Lazar married Milica the daughter of an important aristocrat named Vratko also known as Yug Bogdan - a very wise and honorable man from the Nemanjic family. Lazar had three sons: Stevan, Vuk and Lazar and five daughters: Jelena, Mara, Despa, Vukosava and Mileva. King Dusan the Powerful died unexpectantly in 1355 at the age of 48. This led to a weakening of Serbia's central government. Many dukes used this opportunity to secede from the Kingdom with the land that had been entrusted to them. The young son of Dusan Uros took over the throne and soon was killed. Vukasin Mrnjacevic proclaimed himself the King of Serbia. At this time, Turks were advancing toward the Kingdom of Serbia. In a battle on the river Marica in 1371, Vukasin was killed leaving behind him a weakened, poor and torn Serbia. Serbia was in desperate need of a gifted statesman, rich in virtue and deserving of God's Grace: a man similar to St.Sava and his father St. Stefan Nemanja who had founded the Serbian state. The Church recognized just such a man in Prince Lazar. His talent for leadership, wisdom and experience lifted him above those who would seize the throne by force and sought their own glory and importance. 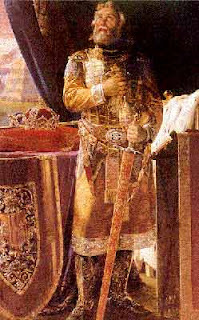 Prince Lazar, first sought to consolidate and strengthen the Kingdom. As was the custom of that day and age, he married his daughters to the rebellious Serbian aristocrats. This enlarged and stabilized Serbia. Having thus secured the loyalty of dissident aristocrats, Prince Lazar turned to those countries which bordered his own, seeking to deepen Serbia's relationship with them. At this time, the Serbian Orthodox Church was in a dispute with the Patriarch of Constantinople. King Dusan the Powerful wanted Serbia to have an independent Church. He single-handedly sought to elevate the Serbian archbishop to the level of a patriarch. The Patriarch of Constantinople utterly rejected this act and broke relations with the Church in Serbia. This was a very serious problem and one which King Lazar managed to solve by reconciling the Serbian Church and that of Constantinople. It was a result of this reconciliation that gave the Serbian Church its first canonical Patriarch. The expansion of that Ottoman state, and increasingly frequent Turkish raids into his land, warned Prince Lazar that the time for a decisive battle was drawing near. Lengthy preparation on both sides preceded this confrontation. The fact that the armies were led by the Turkish ruler Murad 1 and by King Lazar of Serbia illustrates the importance of this battle. 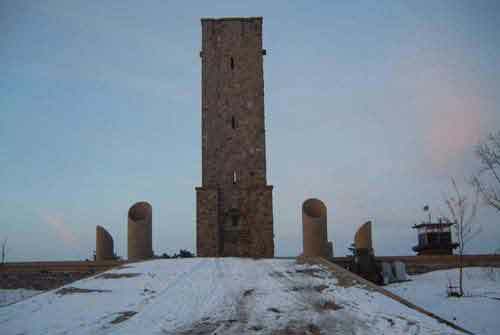 It was decided that the site of the battle would be a field in Kosovo (Kosovo Polje). Prince Lazar knew that his chances against the Turkish aggressor were small and on the eve of the Battle of Kosovo he gathered his upper aristocracy and asked if they should fight for the Holy cross and Golden Freedom or surrender to their adversaries and live as slaves of the Muslims. They had to chose between the Heavenly Kingdom and earthly one. In the true spirit of Christianity they preferred to place their hope in Christ and Eternal Life. The Prince and all of this warriors took Holy communion and went into battle on Saint Vitus Day, Tuesday June 15th (June 28) 1389. In the beginning of the battle Serbian warriors were able to advance. Milos Obilic, the most famous hero of this Kosovo Battle, killed the Turkish King Murad. Despite this unexpected development, the Turkish army re-grouped and over ran the Serbs. They captured Prince Lazar alive, but beheaded him shortly thereafter. Today his earthly remains are amazingly preserved intact and kept in the monastery Ravanica which was founded by him, along with many others churches and monasteries. The faithful gather from all Serbia just as they have through centuries to venerate his Holy relics and to get comfort and healing and to inspire them in the hope and belief that better days will come.